In the Red Storm’s two games last week, the Brooklyn native averaged 32.0 points, becoming the first St. John’s player since Dwight Hardy in February of 2011 to score 30-plus in back-to-back contests. Ponds played the full 80 minutes for St. John’s in those two games, shooting 55.8 percent, or 24-43, from the floor, and 46.7 percent, 7-15, from three-point range . He also made nine of his 11 free throw attempts. Ponds also averaged 6.0 rebounds, 5.0 steals, and 4.0 assists while committing just two personal fouls. The sophomore guard kicked off his week with a stellar performance on Tuesday against No. 6/6 Xavier, scoring 31 points, grabbing five rebounds, dishing out five assists, and swiping a career-high six steals in a closely contested 73-68 loss to the Musketeers at Carnesecca Arena. When Ponds got a layup at the 11:23 mark of the second half, he became the 51st member of the 1,000-point club at St. John’s. Ponds is just the 10th player in program history to crack the mark in his second season with the Johnnies, and he joined an elite fraternity alongside his coach Chris Mullin, Malik Sealy, D’Angelo Harrison, Bob Zawoluk, Tony Jackson, Walter Berry, Marcus Hatten, Mel Davis, and Bootsy Thornton. On Saturday at Madison Square Garden, Ponds etched his name even further in the lore of St. John’s basketball by turning in a huge performance, with 33 points, seven rebounds, and four steals to lead the Red Storm past No. 4/5 Duke in front of a sellout crowd. Ponds scored 24 of his 33 points in the second half, as the Red Storm erased a seven-point halftime deficit before climbing ahead by as many as 11 in the final ten minutes of the game. After the Blue Devils used a 16-4 run to climb back ahead by one with less than two minutes to play, Ponds scored five-straight for St. John’s to help seal the contest, regaining the lead with a driving layup before draining a tightly guarded triple from the wing to put the Johnnies ahead by four with 38 seconds to go. 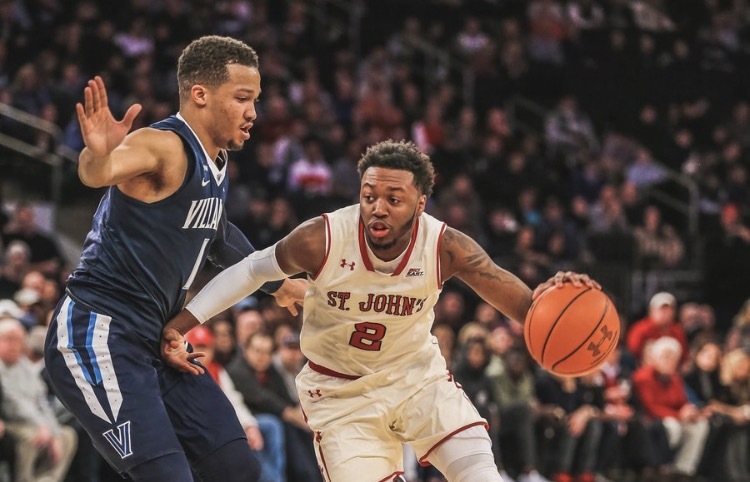 Ponds and the Red Storm will face another big test on Wednesday night when they travel to Philadelphia for a matchup with the number-one ranked team in the country, Villanova, at The Wells Fargo Center.